These Hoka OneOne Clifton 4 are another great edition in this Clifton line of cushioned, neutral trainers. 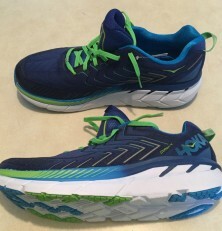 Out of the box they are super comfy, often alarmingly so, like running on a couple of clouds. 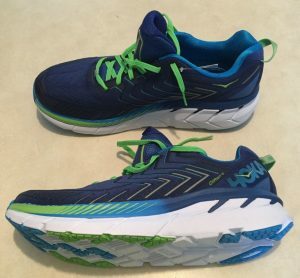 The cushion is such a shock compared to other shoes it feels like I’m running in sand for about a day then I get more accustomed to the feeling. These have been great so far in all terrains and conditions. I’ve already put 121 miles on them at the time of this post and have ran paved roads, gravel roads, paved sidewalks, dirt trail, and grass path and the shoes have felt great in all conditions. 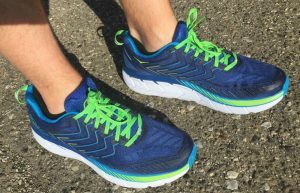 While comfortable and supportive for a long run (longest of 14 miles in them so far I think), I wouldn’t hesitate to do some tempo miles or even a more structured speed workout in them. They’d hold up great for hill repeats, mile repeats, or just cranking out some Strava segments. 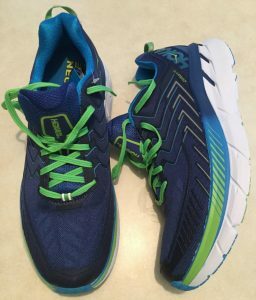 I ran previously in the first and third versions of these shoes and loved them also. I fully expect to get a good 400 miles in these shoes, but will check back later once I’ve exhausted them either way. So far I am quite happy to have these in my lineup of various neutral trainers. While I am lucky enough to have quite a few currently to choose from, if I had to only had to choose a couple, these would make the cut!